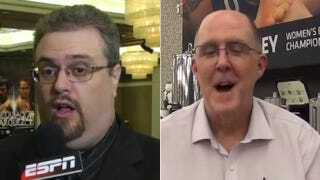 Yahoo Boxing Writer Rants About ESPN Stealing His "Scoop"
Yahoo Sports boxing writer Kevin Iole had a bit of a tantrum last night, getting on his Facebook and Twitter page to wag his finger at ESPN boxing writer Dan Rafael for allegedly stealing a scoop from him. Pieces of garbage! Chicken crap! Iole is fed up! I understand that boxing isn’t nearly as popular as it used to be, but surely things haven’t gotten so dire that reporters need to be starting beefs over who read a press release the fastest.